Over the last few weeks I have been experimenting with how to introduce Python to lower years in secondary school. Now everyone has used and seen the impact of the Scratch Cards on students. Here is my attempt to use the same idea with Python via EduBlocks. These are far more informative than version 1. But not that printable. So I have created a pdf'd version of each below so now they are easy to print off for use in the classroom and Jam's etc. EduBlocks sheet 2: Turning on traffic lights with Minecraft. EduBlocks allows you to code in Python in a Scratchesk drag and drop easy to use interface. The key benefits of drag and drop Python is that it removes/ reduces the barriers of syntax errors by abstracting away some it and allowing you to focus on your instructions. The other great thing is that it also produces the textual version of the code so you can see what the actual code looks like minus all the rainbow blocks. 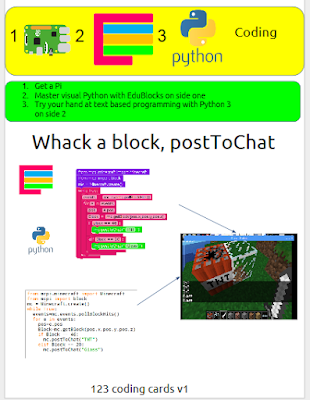 I have produced 3 introductory Minecraft and Python 1, 2, 3 coding cards to start with. Hopefully it will help encourage people to try and code the same hack in EduBlocks and then try the same hack in Python 3 and reinforce and ease the transition from drag and drop coding to text based coding. Here are the first 3.